In 2018, construction output in Latvia grew by an astonishing 21.9 %, according to the latest data compiled by the Central Statistical Bureau (CSB). Compared to 2017, in 2018 construction output1 increased by 21.9 % (according to calendar adjusted data at constant prices) with a rise observed in all sectors – construction of buildings (of 25.6 %), civil engineering (11.6 %), and specialised construction activities (27.8 %). The most significant output increase (2.1 times) was registered in specialised construction activities related to building completion and finishing (plastering, floor and wall covering, painting and glazing, etc.) as well as demolition and site preparation (of 75.6 %). In civil engineering, an upturn was recorded in construction of roads and railways (of 22.5 %) and construction of utility projects (15.3 %), while there was a major downturn (of 35.2 %) in construction of other civil engineering projects (that includes waterways, port and river piers, industrial complexes, open-air sports grounds, etc.). 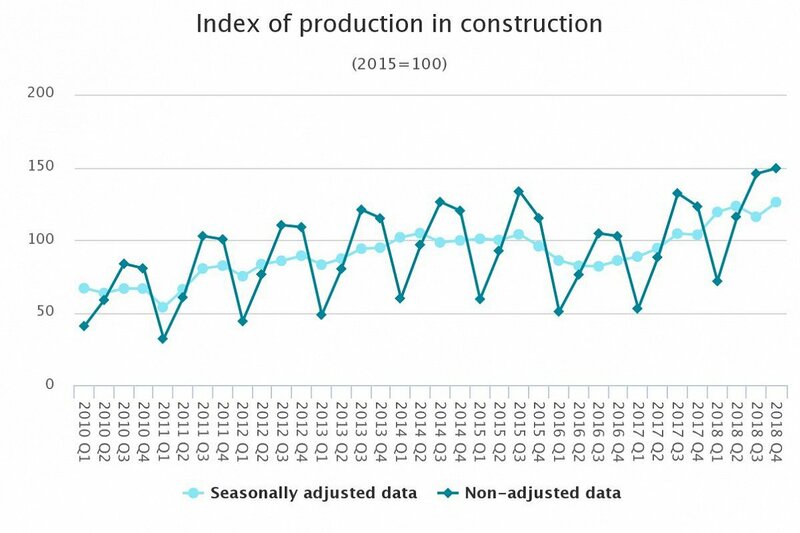 Compared to the previous quarter, in the 4th quarter of 2018 construction output (according to seasonally adjusted data at constant prices) grew by 8.7 %, of which construction of buildings by 9 % and specialised construction activities by 18.6 %, while civil engineering reduced by 5.6 %. In 2018, 3,130 building permits were granted for the construction, capital repairs, reconstruction and restoration of buildings with the total floor space of 877 thousand m2. To put the figure into perspective, the only comparable increase of such magnitude occurred in 2002 when construction production increased by 21.6%. Then during the so-called boom years of 2003-7 construction production saw increases of between 12% and 15% per year, before the disastrous crash of 2009 saw a dramatic fall of 44%.